If you haven’t already (as I mention the lovely lady on my personal Twitter pretty much every day! 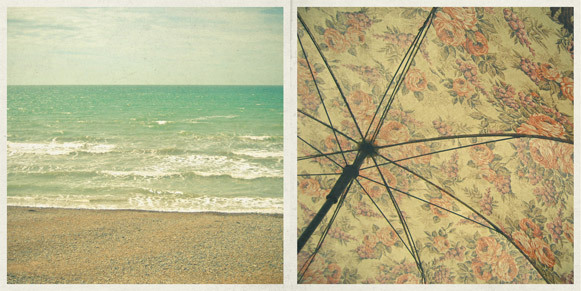 ), take a look at Cassia’s wonderful vintage-inspired photographs. She’s just made the front page of Flickr’s Explore with this colourful collection of beach huts, shares her favourite things on her blog and sells prints through her shop on Etsy and on All Things Original. If you’re in Brighton this weekend, be sure to drop by the IO Gallery at 39 Sydney Street where a selection of her retro TTV images are for sale. They’ll only be available there until Monday 24th August, so be quick! Jeff Altman, an assistant film colourist, has been restoring a bunch of his grandfather’s old 16mm home movies — including this absolute gem of a family vacation to Disneyland in 1956, a year after the park opened. The Onion, the bastion of all credible news sources, has revealed that a Walt Disney World maintenance crew accidentally stumbled upon an 2,300 year old underground chamber containing more than 8,000 terra cotta Mouseketeers. 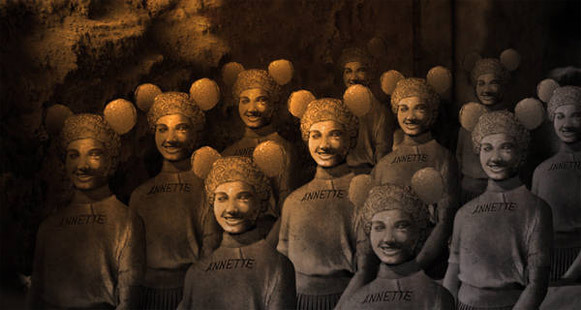 According to photographs surfacing from the dig site, the terra-cotta Mouseketeers are arranged according to rank, from Annette to Cubby, and appear to be marching or tap-dancing in place. On the walls of the tomb, archaeologists have discovered a large fresco that depicts thousands of the mouse-eared foot soldiers bowing before what appears to be a large reptilian figure wearing a crown. The apparent king is shown seated upon a throne of skulls and bears a striking resemblance to Walt Disney. While working this evening I downloaded and listened to the latest Retronauts podcast. I hadn’t listened to it before and was surprised to discover that it had been replaced with a podcast for another 1Up offering, The Grind — an RPG games blog. As I’m not adverse to such things (and because they mentioned Fallout at the start of the episode) I listened to it anyway. But that’s not what this is about! When I was about seven years old I ordered a book called The Warlock of Firetop Mountain from the school book club. Probably because, to a seven-year-old, it sounded pretty cool and most likely because it shared a premise with my favourite game of all time, Advanced Dungeons & Dragons for the Intellivision. Part-way through the podcast I thought I heard a reference to this book and — sure enough I had! It turns out that a company called Big Blue Bubble, developers of, uh, nothing really, are producing a game based on the original Steve Jackson/Ian Livingstone-penned book for the Nintendo DS. It’s unlikely that the game will live up to the lofty heights my wide-eyed seven-year-old self held the book but the screenshots look promising. Fighting Fantasy: The Warlock of Firetop Mountain for Nintendo DS is scheduled for release at the end of 2009.